The California coast is considered one of the most beautiful and valuable landscapes in the world. Broad, golden beaches, wildlife, waves, sunsets, and seemingly endless iconic bluffs. On the surface, California’s coastal cliffs appear durable and tough, but Mother Nature and development can cause rapid erosion that threatens their stability. Coastal communities and economies depend on them for many reasons, but the cliffs are a symbol of both California’s beauty and fragile environment. In many towns along the coast, the bluffs are where community begins. They stand at the edge of a neighborhood or street, while acting as causeways and access points for millions of beach goers, tourists, and surfers every year. Due to this constant foot traffic, weather, and erosion, these cliffs can be difficult to maintain, especially in the busiest parts of San Diego county. 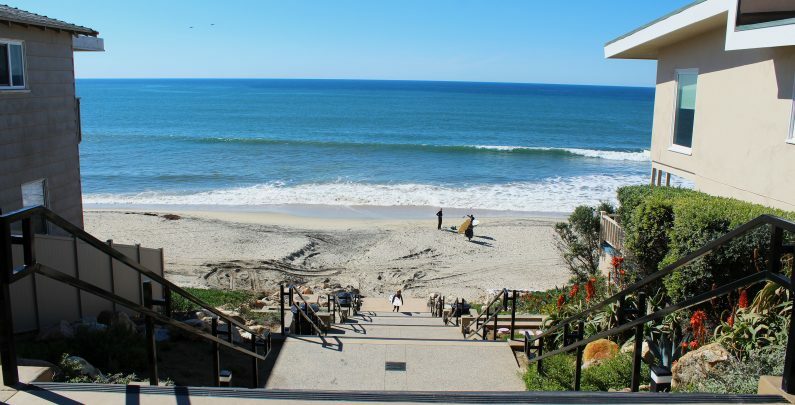 The City of Carlsbad has some of the most iconic and historic cliff-to-beach access points, and they are immediately adjacent to the downtown Carlsbad Village area. The city’s plan was to revitalize these 5 heavily used, but narrow pathways for long-term stability, traffic, and beauty. Designs would have to incorporate new stairways and landings, lush landscaped tiers, and drainage systems from the top of the access to the bottom, where toes meet the sand. Every aesthetic element was required to blend in with the environment and provide stable ground cover, while all structural elements needed to provide a functional foundation in these adverse conditions. These site constraints created a true multifunctional design that could have the City of Carlsbad setting the standard for the future of California’s iconic coastal projects. 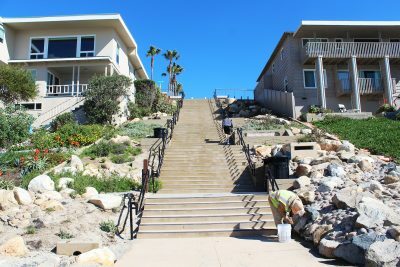 Carlsbad’s intent was to remediate each pathway along the historic Carlsbad Village bluffs. These renovations required the city to not only comply with the local stormwater regulations, but to do so with solutions that would cooperate with limited space and steep slopes, while providing an aesthetically pleasing finished product. Options can be limited given space restrictions, land value, and high foot traffic. Some of the state’s strictest stormwater standards are enforced within this threshold to the coast, so it is essential that the solution meet Washington State TAPE protocol in conjunction with the California Water Control Board’s full capture compliance. Sean Hasan of Bio Clean Environmental notes, “The final product had to solve problems and provide cleaner beaches and stable public areas for years to come. 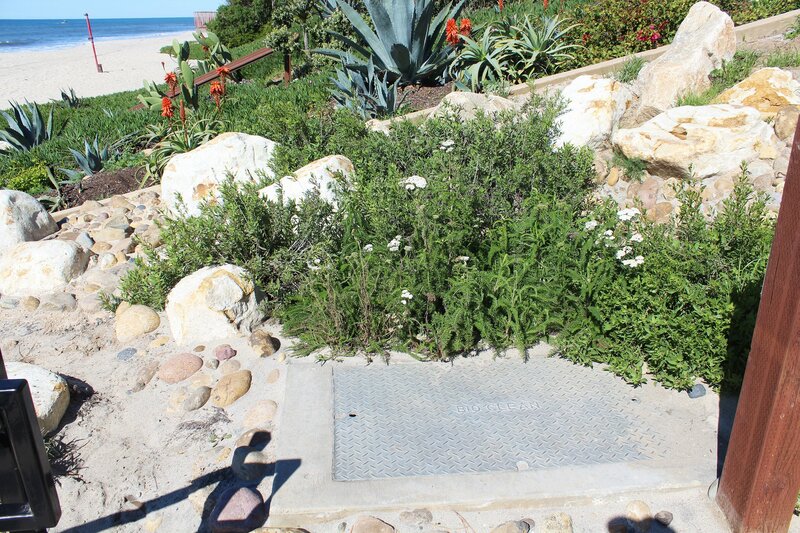 The challenges were straightforward yet there are virtually no other stormwater solutions that could address every architectural challenge and the environmental solutions the City of Carlsbad needed”. Stormwater runoff from streets and parking lots above the beach and pathways would inevitably collect pollutants that had to be treated from the water within a small area before those flows could meet the Pacific Ocean, merely a few feet away. 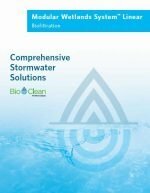 Bio Clean’s Modular Wetlands® System is widely used to meet regulatory and site constraint challenges in San Diego county, and it has become one of the most successful stormwater biofiltration systems in the country. What is unique about the Modular Wetlands® is its innate ability to reduce BMP footprint. It is the only biofiltration system with horizontal flow technology which naturally delivers unique flexibility and customization benefits that are invaluable to projects in tough terrain; or in high value real estate. According to Sean Hasan of Bio Clean Environmental, “It’s an exceptional design, because although the City of Carlsbad was under pressure to meet water quality standards, this system can still provide superior and proven treatment within a smaller footprint or adjustable height well within their budget. The ability to place these units in either a large pathway or narrow walkway within a quarter-block distance down to the beach, provided the perfect solution for compliance”. In addition to saving space, the Modular Wetlands® System blends in with its surroundings by incorporating almost any indigenous vegetation into the visible/open chamber of the system, one of the beautiful iconic features of the system. Ultimately, five smaller Modular Wetlands® units were deployed at five different beach access points along Ocean Street, and each will successfully contribute to the beauty of Carlsbad and the protection of the California coast and Pacific Ocean for years to come.